Siddaramaiah-led Congress government's move to give minority status to the politically powerful Lingayat community in Karnataka has run into trouble. 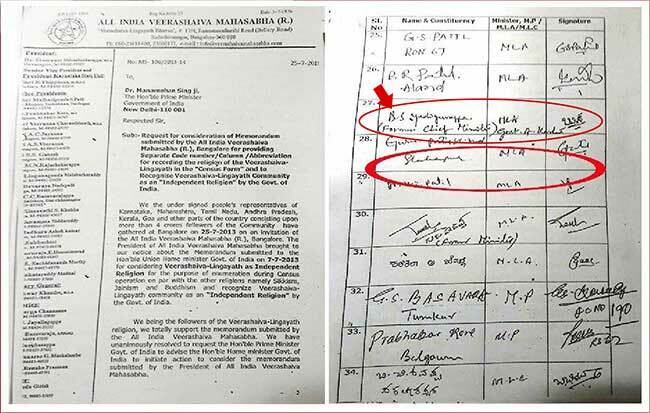 New Delhi: Documents accessed by NDTV suggest that the BJP and the Congress, locked in a political battle over the demand for religion status to Karnataka's Lingayat community, may be guilty of double standards. On Monday, the Congress-ruled Karnataka approved the demand for separate religion status for the Lingayat community, fueling a political war of words. The BJP claimed the Congress was playing divisive politics just before state elections. "The idea of #BreakingIndia by dividing Hindu Religion is the brainchild of Sonia Gandhi which has been cunningly executed by @siddaramaiah who is an expert in "Divide & Rule" policy", Tweeted BJP's General Secretary in Karnataka, CT Ravi. The idea of #BreakingIndia by dividing Hindu Religion is the brainchild of Sonia Gandhi which has been cunningly executed by @siddaramaiah who is an expert in "Divide & Rule" policy. As #CongressDividesHindus to install an Incompetent Dynast as PM the Nation continues to suffer. But in July 2013, it was BJP leader BS Yeddyurappa, currently the party's chief ministerial candidate, who was a signatory to a petition by the All India Lingayat-Veerashaiva Mahasabha addressed to then Prime Minister Manmohan Singh, asking that the Lingayat community be recognized as an "independent religion". BJP spokespersons told NDTV that Mr Yeddyurappa was not a member of the party when he signed the petition. The Congress has denied that its decision is linked to the upcoming election. But a letter by the union home ministry in 2013, when the Congress-led government was in power, rejected the Lingayats' demand. "Veerashaiva/Lingayats are a sect of the Hindus and not an independent religion", the letter read, adding that the demand was not "logical". Karnataka minister MB Patil, who has been at the forefront of the latest Lingayats' push, sought to clarify the Congress' earlier stand. "There are two types of Veerashaivas with us. One believes in Basveswara and the other is a sub-sect of Lingayat," asserting that the Congress' response was a technical error back then. But the letter addressed by the Ministry clearly states them as "Veerashaiva-Lingayat".